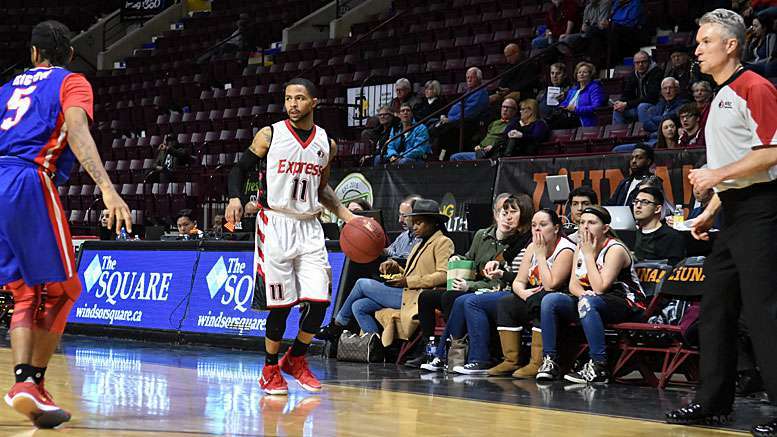 (WINDSOR, ON) – Needing a win to halt a 2-game skid, the Windsor Express welcomed the Cape Breton Highlanders to their crib Thursday evening for some NBLC action. The 1,000+ fans in attendance weren’t disappointed as the Express dominated the 3rd quarter en route to a 109-92 victory, snapping a 3-game loosing streak. An early 2-handed slam by Damontre Harris, from a dish by Chad Frazier, got the fans into the game after a slow start. A Logan Stutz rejection under the basket allowed Windsor to return up court where Stutz dropped a trey for the lead. Two by Harris from the line put Windsor in front by 5 to stay. Some sloppy ball handling allowed the Highlanders back into the running until Shaquille Keith went to the line and put 2 away. Jones was noticeably more involved in directing the on-court efforts of the Express. Though Windsor had some trouble again defending the perimeter, they were able to hit from downtown on demand and put up 36 first quarter points to Cape Breton’s 24. Not even the insertion of Rick Bodiford and former Express fan favourite Kevin Loiselle could help the visitors. Keith caused issues for Loiselle all night and the frustration became more apparent as the game wore on. Montreal native Loiselle contributed just 9 points for the Highanders while Keith, from Toronto, shot 6-for-16 from the floor for 16 points. Windsor began the 2nd period being unable to bring down a defensive rebound. In the early going they gave up 7 points to Cape Breton on the 2nd chance. The Highlanders cut into the Express margin on an 15-6 run before Harris hit his patented 2-handed dunk, from Stutz. The slam seemed to re-energize the Express as they embarked on their own 11-6 run punctuated with some stellar defense. The team moved the ball around the court to open space up, but there also was more communication than was seen in recent games. Windsor escaped their play in the quarter with a 53-52 half time lead. After shooting 50 per cent from beyond the arc in the opening quarter, Windsor went 0-for-6 in the second 12 minutes to severely curtail their scoring. Stutz led the scoring in the 1st half for Windsor with 15 points while Harris dropped 10 in addition to 5 board. Cape Bretons Bruce Massey Jr and Duke Mondy had 12 points apiece. The 3rd quarter began with the teams trading buckets until Stutz hit the long ball followed by another Express bomb. From there all Hell broke loose. Windsor met the Cape Breton offense with staunch defense and before long the Highlanders began raising issues with the officiating crew. Windsor was winning the battle in the paint as well as the long range strikes. Cape Breton was assessed 2 technical fouls in the quarter including one to head coach Rob Spon. Heading into the final frame, Windsor held a 90-72 margin. Windsor opened the quarter on a 11-5 run and quickly passed by the 100-point mark. Faced with a seemingly insurmountable task, the fouls by Cape Breton became more pronounced and desperate. However, the players settled down to an almost snail’s pace by comparison. With 2 minutes left to play, the Express were holding on to a 107-85 lead. Head coach Bill Jones took the opportunity to get some minutes for the lesser used players on the Windsor roster. Stutz concurred with Cusumano’s assessment. The big forward laid up a game-high 25 points including 3-for-7 from outside. There’s no time for Windsor (8-11) to bask in the limelight of the win. They are back at practice over the next two days in preparation for a meeting with London (14-6) on Sunday for a 2pm matinee.